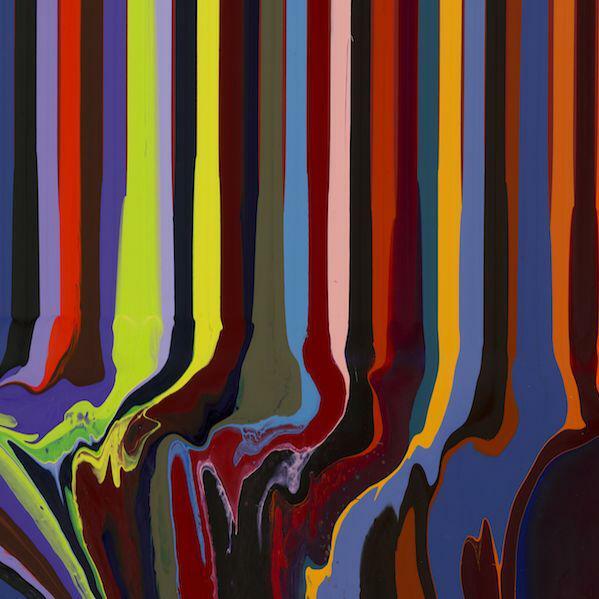 Ian Davenport, born in Kent, England, in 1966, is as fascinated by stained-glass windows as by Vincent van Gogh‘s sunflowers or The Simpsons. "I‘m not interested in the narrative aspect, only in the colours,“ the artist explains his eclectic tastes. Colour plays a pivotal role in his work, in which he wishes to render palpable the energy arising from the combination of various hues of colour. Emulating Bridget Riley‘s dictum, „Colour energies need a virtually neutral vehicle if they are to develop uninhibitedly.“ Davenport has chosen the stripe for his vehicle. Donald Judd and Brice Marden are often cited as role modes for Davenport. But his works – especially his Puddle Paintings – clearly point beyond minimalist concepts. Davenport also plays the drums in a band, and in his abstract paintings explores art‘s musical qualities. Rather than using separate colours, he composes with the tonalities of a dozen or more, placing contiguous stripes on a pre-tinted ground and thereby producing a powerful groove. A hint of anarchy cuts through Davenport‘s cool Minimalist severity. This is true also for the tale of how he found his artistic identity, an ironic take on the myth of the artist‘s quest for transcendence: he was a hungry and homesick student at Goldsmiths College in London when, in an act of artistic self-help, he painted a bar of chocolate. His teacher immediately identified the painting as a grid in the spirit of Minimal Art. The 1991 Turner Prize nominee also demonstrates a rebellious autonomy in his choice of materials. For example, doing what artists were not supposed to do, he initially used dispersion paints, switching to higher quality acrylic paints later on. He places a paint-filled syringe at the top of a sheet of thin steel, allowing the paint to flow downward. In his Puddle Paintings he breaks the flow of colour by bending the bottom part of the metal sheet so that it becomes a horizontal plane on which the lines of paint can expand into puddles. In Davenport‘s work control meets chance with surprising effects. This is particularly true for his most recent Puddle Paintings, which quote the colour scales of historic masterpieces, paintings by Hans Holbein the Younger or Cézanne, for example, which Davenport digitalises and submits to computer analysis. The exhibition features Puddle Paintings after works by Paul Gauguin and Pierre Bonnard, but whether or not a painter or painting are famous is irrelevant. Davenport is interested in the kinds of paints historic artists were able to use (far fewer in earlier times than at present), the way in which paints were used, and to what effect. In a complex procedure, Davenport composes a new piece based on the colour palette of a historic painting. The temperature of the originals emanates from the Puddle Paintings while their structure follows Davenport‘s rhythm. The show also features a selection of Davenport‘s works on paper – each a unique specimen – and extraordinary colour prints, which engage in a fascinating dialogue with the paintings. His large-scale prints, as entrancing as tuneful melodies made visible, have been produced according to the highly complex traditional method of dry-point etching, in which a needle scratches through the etching ground placed on the surface of a copper plate; the plate is then placed in an acid bath where the chemical action produces the lines of the drawing. In order to transfer the flow of colour to the plate, Davenport photographs a painted study, transferring the digital image onto three plates – one each for the bands of colour 1, 4 and 7; 2, 5 and 8; and 3, 6 and 9; etc. The production of a clean image without overlaps in the successive printing stages requires extreme care, a care that is ultimately eclipsed by the colours‘ exhilarating harmony.